Your vehicle has many moving parts that work constantly to keep your vehicle running and operating properly. Often your vehicle gives you a warning when most parts start going out and need repair. For example, you break light can come on to let you know that your brake pads are due for a replacement. But you don’t get any hint when your ignition switch lock breaks down. 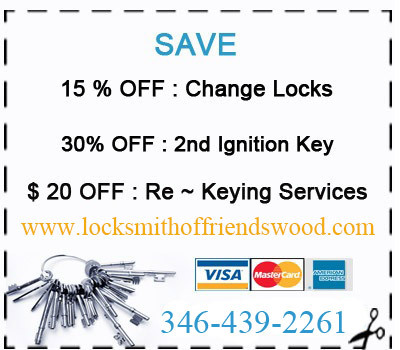 If you can’t start your vehicle because of this call King Locksmith of Friendswood to provide you with ignition key replacement service. We have this part in stock for many types of vehicles and can replace it fast. Our assistance is available to you 24 hours a day as well. Whether on a weekend or holiday, we are available to help you 7 days a week. Are you having a problem with your ignition and are stranded because your engine can’t start? In case you have this issue and need car ignition repair, our fully and highly experienced locksmiths are on hand and can help you quickly. Whatever part of Friendswood, Texas you are, we can come and help you even if it is on the road side, work, and mall or at the park. No one likes to be prevented from getting locked out of their cars or their homes? When this happens, frustration can turn into anger which can again revert to exhaustion since you don’t know what to do.